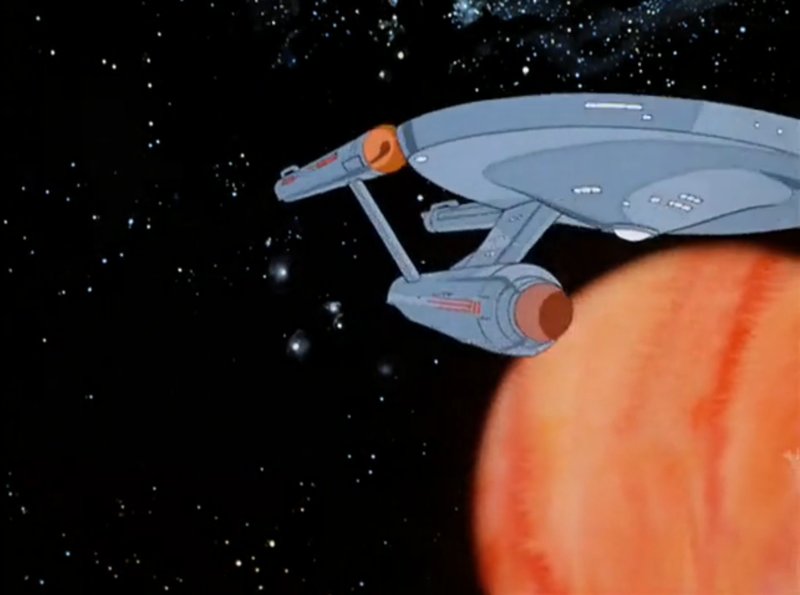 The Enterprise, in all its animated glory. The premise of Star Trek: The Animated Series is obvious–to depict the remainder of the TOS Enterprise‘s 5 year mission. However, the transition to an animated, half-hour format presented many new problems and opportunities. For one, it was much easier to depict non-humanoid aliens and incredible events (things that, today, are done with CGI in live action productions). On the other hand, we now have half as much time to develop the story, and a much smaller budget with which to animate these stories, to the point where they couldn’t afford to bring Walter Koenig back as Chekov. Given what it is, much of the character and setting are already in place and well-developed from TOS, so there’s no real need to delve into all that the way I usually would in a Primer. Let’s skip straight to the good part, eh? Bringing back the original cast is definitely TAS’s saving grace. Aside from the budget problems, some of the cast had other obligations (Shatner infamously recorded his lines while on the road with a play), so pulling this off was very difficult. It lends the show some immediate credibility, which it really needed at the time. This even extended to important recurring characters, like Sarek and Harry Mudd, amazingly enough. When you compare it to its contemporaries in the Saturday morning cartoon world, TAS’s writing is incredible. 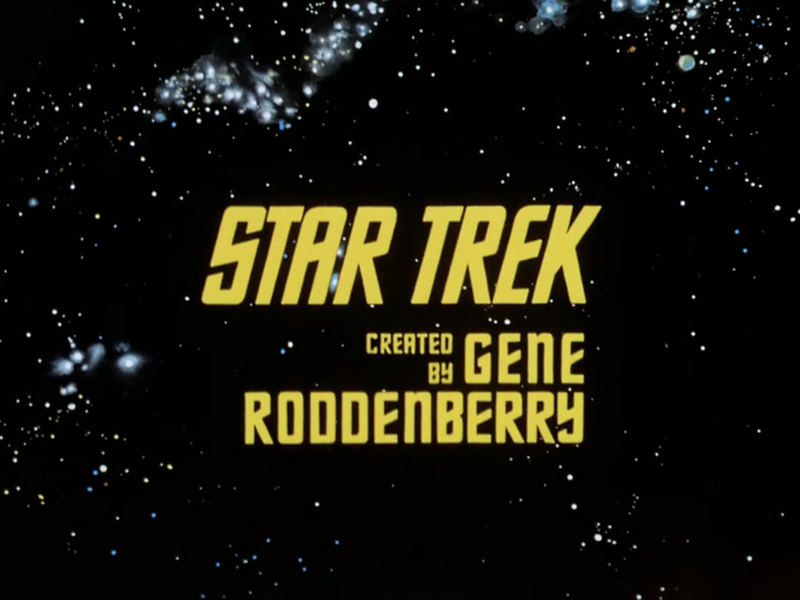 “Yesteryear” is the episode most people point to (it inspired much of Spock’s backstory in the 2009 film), but “More Tribbles, More Troubles” and “The Slaver Weapon” also come from well known writers, the latter being a sort of strange crossover/adaptation of a story Larry Niven’s Known Space series, written by the man himself. As I mentioned above, the animation presented new opportunities for Star Trek. Since an animated character can be drawn to look like anything, the aliens no longer had to be bipedal humanoids or fuzzy energy clouds. This is how we end up with 2 new nonhumans among the crew–Arex, a 3-armed, 3-legged Edosian who takes Chekov’s spot, and launcher of a thousand Furries, the Caitian M’Ress. But it extended beyond the characters, too; TAS visits spectacular vistas as well, such as underwater worlds and “burned out supernovas,” and the animation offered tons of other special effects bonuses that would’ve been off-limits to writers before. One of the side-effects of trying to aim this more at families and children is that the stories are often much more likely to have a happy ending. Kirk’s attempts at talking down the monsters and working out a peaceful solution are more likely to succeed, thus making TAS even more of an idealistic world than even TOS was. In that sense, it might be seen as even truer to the core messages at Trek‘s heart. Kind of on a meta level, but Star Trek: The Animated Series‘ very existence was a good thing for the franchise as a whole, as it kept it in the public’s mind through the early 70’s and helped to maintain interest on an executive level in finding a way to reinvigorate Star Trek. Attempts at doing so directly led to the undeveloped Star Trek: Phase II and eventually to The Motion Picture. Imagine those giant wings on a live actor. You know how I said animation offered them a lot of new opportunities? Well, they didn’t always use it to full effect. The show’s animation is very jerky and stiff, revealing its low budget; a lot of shots have mouths obscured, or are completely static shots where only the mouths move, without even so much as blinking. Many, many shots are reused over and over again, even when they don’t fit continuity-wise, such that binge-watching makes it very apparent. One particularly bizarre case is the attacking “pterodactyls,” which is used in different contexts, slightly edited, in 4 different episodes within the first season alone. Additionally, the coloring of things in the show is very wonky. People’s uniforms will randomly change color. A huge number of things are pink for no obvious reason–Klingon uniforms, Kzinti ships, Tribbles… as it turns out, director Hal Sutherland was partially color-blind, and mistook pink for gray. There’s also just a general sense of everything being “brighter” than it should be; for example, there’s nothing wrong with the interior of a Romulan ship being green, but the exact shade of green they use seems far too bright and cartoon-ish. The half-hour timeslot really cuts a lot out of the stories that would’ve been interesting to see. 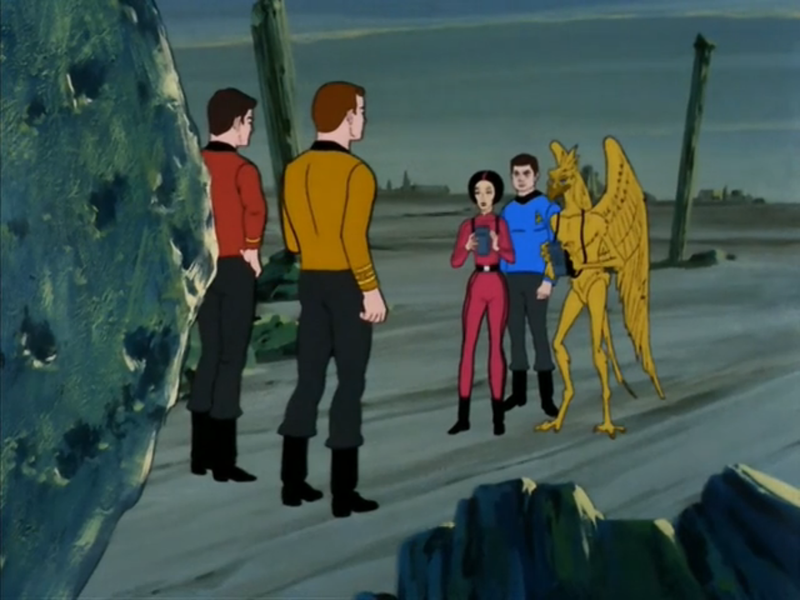 One episode sees Kirk and his landing party being kept in an alien “zoo,” and when he tries to get Scotty to beam them out, the Enterprise accidentally beams up one of the aliens instead. This naturally causes Kirk a lot of problems on the surface, but when Scotty eventually comes back to save them, he talks about how he made contact with the alien and managed to convince them they’d meant no harm. That’s the kind of thing that CLEARLY would’ve made up the B-plot of a full hour episode, and actually been fascinating to watch, but the time constraints meant we only hear about it secondhand from Scotty. Very unfortunate. While the writing is often very good for an animated 70s series, some of the episode premises are just utterly outlandish. Watching over the series, it’s not hard to see why Gene Roddenberry didn’t want to consider it canon. In it, we have things like Kirk and Spock befriending the actual devil, who helps them perform magic (Spock even draws a god-damn pentagram at one point), or a colony of people who’ve been shrunk by blah-blah radiation to a mere 1/16th of an inch tall, or Spock getting cloned into a 20-foot-tall body. This kind of insanity is obviously part of the adjusted audience of children, and one of the reasons it’s so often derided by fans. Allowing this show to be canon has huge implications for the rest of the universe because it’s just so different. It can’t fit, and it cannot be allowed to fit. It’s cool to have non-human characters around, but M’Ress and Arex are disappointingly underdeveloped. They never get any spotlight time, and rarely have much in the way of lines aside from exposition. They have almost nothing in terms of characterization. Additionally, it kind of steals Spock’s thunder of being “the alien one” when there are people on the ship who are far, far less human-like than he is. They changed the theme song! What? Why?! All in all, Star Trek: The Animated Series is the black sheep of the Star Trek family, but it’s a member of the family nonetheless. For completionist fans, it’s worth a watch, and anyone eager for just a little bit more after finishing TOS would likely get some enjoyment out of it. I must admit, there’s something magical about hearing the original cast in “new” stories, even when the stories themselves were a bit of a letdown. It might be better to look at this lightly, the way one might read a Marvel:What If? or DC’s Elseworlds comic. What if Kirk met Lucifer, who turned out to be a magical alien? What if Spock accidentally time-traveled himself out of existence? Then we can enjoy these episodes as unique thought experiments, without worrying ourselves with the continuity effects of having personal force-fields that are never seen again. On the other hand, if you don’t like TOS and somehow made it this far into the article, then there’s absolutely nothing of value for you here. If you’re in the middle, consider trying a few of the “sequel” episodes, like “More Tribbles, More Troubles,” “Yesteryear,” or “Mudd’s Passion.” These have the most appeal to a Trek fan curious about TAS. 3/5 UFOs. Appeals to dedicated Trekkies, and little else. A quick reminder of my rating system: a 5 represents must-see–a “hidden gem,” as it were. A 4 is good, solid television. A 3 is “cult classic” stage, where the show’s appeal is likely limited to a specific group. A 2 is flawed, but fun, or even “so bad it’s good,” depending on the series and its release timeframe. A 1, of course, is avoid at all costs. Star Trek: The Animated Series is available on Netflix, Amazon Prime, and CBS All Access. You can also pick it up on DVD, and recently it was remastered for BluRay in the 50th anniversary collection, but isn’t available outside that set (yet?). the re-use of the pteradactyl animation isnt what bothered me, it was the sound they made. you hear it SO OFTEN and its piercing and headache inducing!